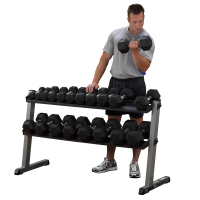 Vertical storage allows over 100 vinyl dumbbells , from 1-15 pounds, stored in a compact space with easy access. 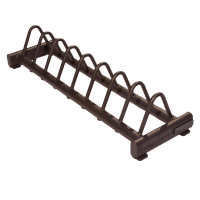 Heavy gauge steel oval tubing provides a solid and stable storage solution. Heavy-duty kasters for easy transportation. 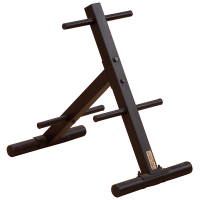 Keep your workout area safe, clean and organized with this Olympic Weight Tree & Bar Rack from Body-Solid! 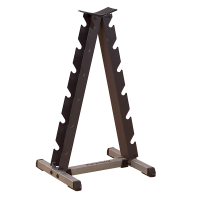 Six 2" x 8" weight plate storage posts keep plates safely suspended off the floor for easy storage and removal and can hold up to 1,000 lbs. of weight. 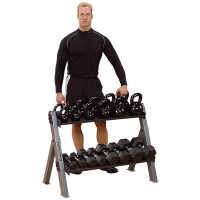 Two Olympic bar holders store all styles of Olympic bars. 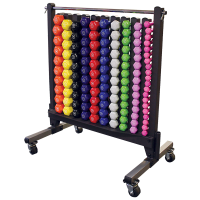 Rock-solid EZ-Load design directs the weight load to the center reducing the risk of tipping. 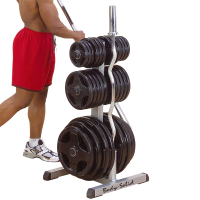 Six storage posts suspend your weight plates for fast and easy storage and retrieval. 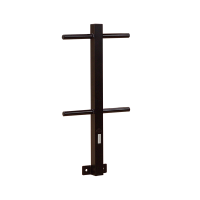 Gym Weight Tree is 1” weight tree attachment has 4 1” horns to accommodate both Olympic and standard weight plates. 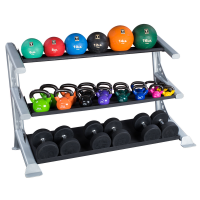 Pro ClubLine Modular Storage Rack is perfect for the storage needs of any facility, the new SDKR1000 storage rack offers unparalleled flexibility for storage of Dumbbells, Kettlebells and Medicine Balls.